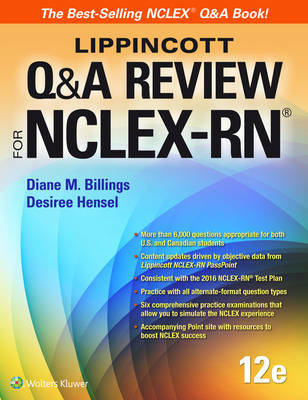 Lippincott Q&A Review for NCLEX-RN, 12th edition is designed to help pre-licensure nursing students prepare to take the licensing examination. Students and faculty also use the book is as a study guide and practice tests for preparing for faculty-made examinations. Because the questions found in the book are also available in PassPoint, the products used together act as an ongoing assessment tool to monitor progress throughout the nursing curriculum. The book is designed to support the four major content areas in pre-licensure programs: obstetrics, pediatrics, medical-surgical, and mental health nursing. Within each of the four sections, chapters are organized around common health problems. When studying, students can select examinations that parallel the content in a particular course in a variety of curricula. PassPoint offers the same flexibility for review and study. The textbook also includes six comprehensive examinations to provide students a realistic example of the NCLEX-RN test, in which test items are randomized by subject area and difficulty. This consistently bestselling NCLEX-RN review book features more than 6,000 high-level questions that prompt active learning and higher-order thinking. The questions support the National Council of State Boards of Nursing (NCSBN) 2016 RN test plan and are written in the style used on the licensing examination. Other features include the use of all the types of alternate-format questions found on the licensing examination, detailed rationale for both correct and incorrect answers, information about the NCLEX-RN, study tips, and a "Content Mastery and Test-Taking Self Analysis" grid by which students can chart their own progress and modify study plans as needed. The accompanying site on thePoint provides an opportunity for students to practice taking computer-generated exams as well as taking "audio" questions that require students to listen to audio files to answer.